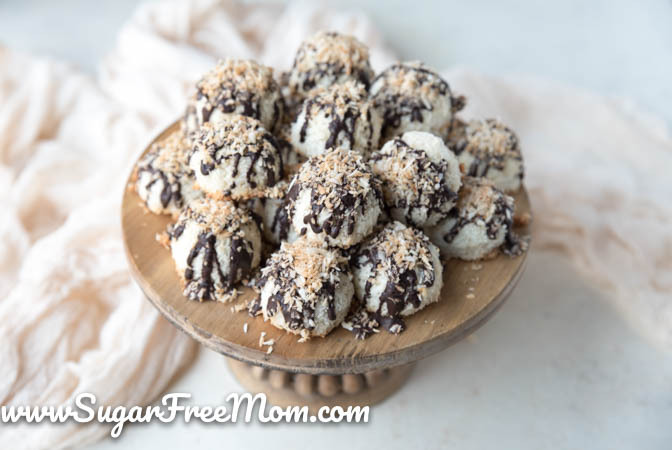 These easy delicious Sugar Free Coconut Macaroons are Dairy Free, Keto, Gluten Free, Low Carb and super easy to make! 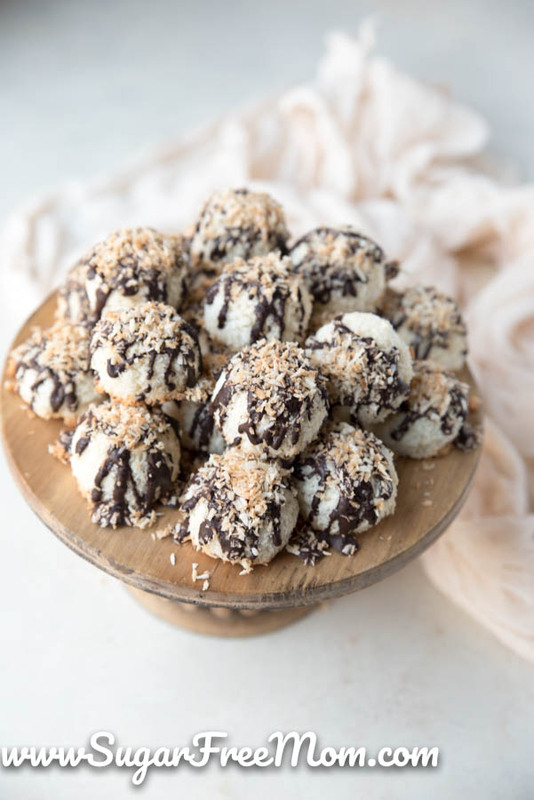 If you’re a fan of coconut, these little cookies will be right up your alley! 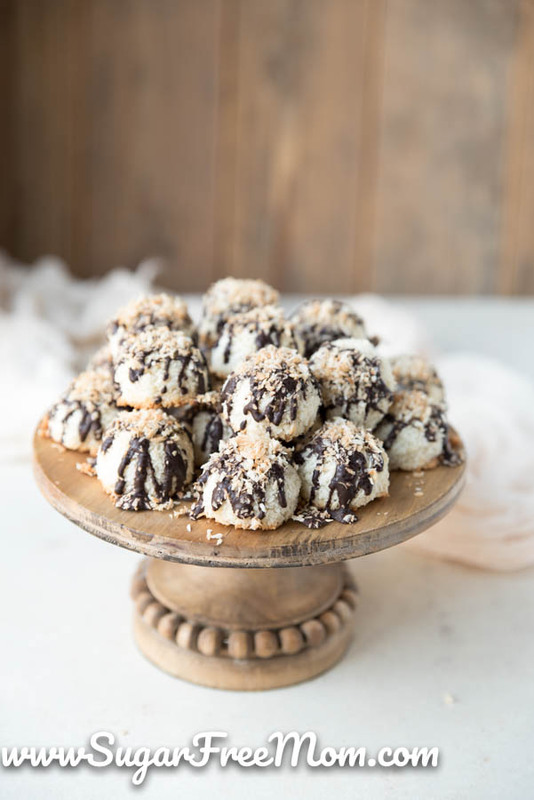 Coconut macaroons are a delicious and light cookie made with only a few ingredients. The best part of course, they are sugar free! 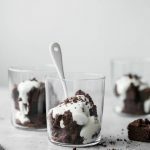 Adding a little melted unsweetened carob chips drizzled over the top makes these the perfect little non guilty pleasure! Using an ice cream scoop will ensure the perfect little size for you cookies! Once completely cooled on a wire rack the cookies can be coated with melted, unsweetened carob chips or grain sweetened chocolate chips. Place a baking pan underneath the rack to catch all the yummy drippings. A macaroon is one of my dad’s favorite cookies. It’s more like a biscuit, a bit chewy, kind of delicate, and not too sweet and that’s how my dad likes them. 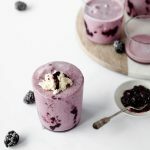 You can certainly make them sweeter by adding more stevia or adding more of your favorite sweetener. Preheat oven to 325 degrees F. Line a sheet pan with parchment paper. Place the egg whites in a stand mixer with the cream of tartar and blend until frothy. Set aside. Place the coconut butter in a microwavable bowl and microwave 1 minute until melted. Set aside to cool. Add in the salt, stevia, vanilla extract, and shredded coconut into the stand mixer and blend until just combined. Pour in the melted coconut butter and blend again. 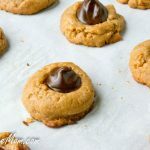 Using a large cookie scoop, scoop batter and pat down into the scoop to pack it in well. 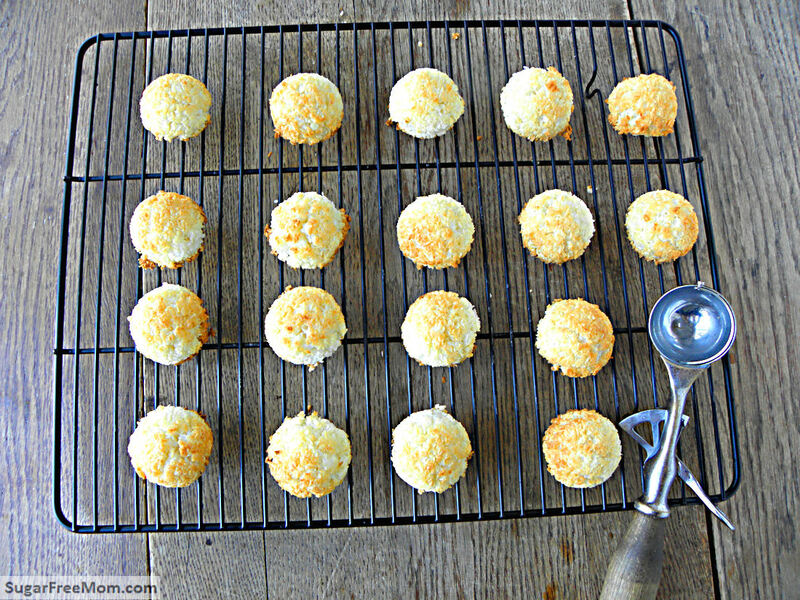 Release these onto the sheet pan, spacing each macaroon about one inch apart from each other. Bake 20-25 minutes until lightly golden. Cool 5 minutes then transfer to wire rack. 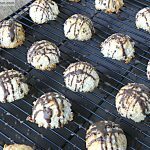 Once completely cooled, you can melt the chocolate chips and drizzle over each macaroon. 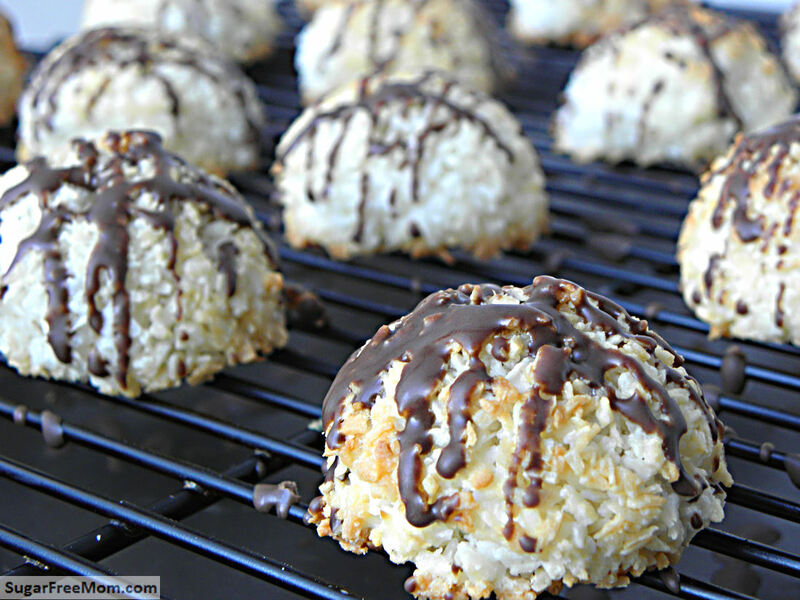 Top with toasted coconut flakes if desired. Fabulous recipe. Printing to make very soon. OH MY! Just lovely. 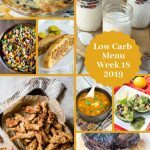 Why do use carob instead of unsweetened chocolate? Using unsweetened chocolate will require adding sweetener because it’s so bitter which of course you can do. 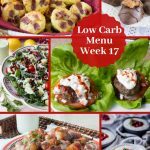 But using unsweetened carob you won’t need to add anything to it and can melt it as is. Carob has a natural sweetness to it and is not bitter at all so I prefer to use that to drizzle over things. Just made a batch, and I absolutely love them. Vanilla Creme flavoured though, because I don’t have Coconut Stevia. 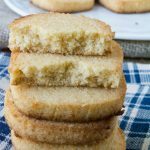 I also don’t have coconut butter, so just used coconut oil, and it still worked fine!Great recipe! I was wondering about substituting coconut oil for the coconut butter. I was going to try that, and I’m glad that it worked out for you. I’ll give it a shot! i do not have coconut stevia liquid… i just have the powdered stevia…. any ideas as to amounts? or what i could add to make it coconut stevia? i have everything else. email was wrong in the last comment… this one is correct, sorry! From all I have read on bags of carob chips, carob is NOT gluten free. They have barley, which contains gluten. Caron chips that are sweetened are sweetened with barley malt. Unsweetened carob chips do not have barley malt in them and therefore are gluten free. I tried these and used coconut oil and they were just fine. Sooooo delicious! Quick and easy too. The only thing is I used large flake coconut and the large shreds got stuck in my cookie scooper. Next time I will chop up the large flakes a bit or get some smaller shred coconut. Almost forgot, I didn’t have the sweetener called for so I used splenda (had to guess at the amount) and they were good. 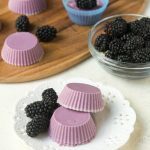 I have also used splenda sugar blend, which of course makes them NOT sugar free, but they were a batch I was making for someone else. She declared them the best ever, so I guess it worked. Thanks for this great recipe! Next time I will pay attention better. I also used large flake coconut which got caught in the cookie scoop. Next time also I will chop up the coconut or use smaller cut. Happy accident though, still edible because I love coconut. Hoo boy! Making these goodies for my Mom in a nursing home whose diet is restricted for sweets- they will be perfect and she will be so happy! Me too, as macaroons are one of my favorites. Thanks! It says 5g of sugar per serving. How many in a serving? I can do about 6g in one sitting without getting on the sugar roller-coaster. So happy you said something because I recalculated my nutritional info and realized there was a mistake! 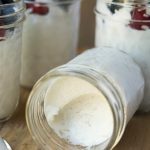 I had mistakenly used sweetened coconut flakes in the site I use to figure everything out instead of unsweetened which made a huge difference! It’s all accurate now. Is that .3 grams of sugar per cookie now or 3 grams per cookie? Thanks! It’s point 3 per cookie. I’m very disappointed with your site—I’ve never seen it before and won’t be looking at it again. 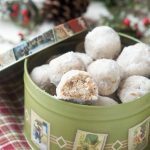 First, I wanted a recipe for the sugar-free macaroons, and tried to use your link to get to it on Sweetleaf Stevia, but I was redirected to Wal-Mart’s site. I don’t shop Wal-Mart. If you’re not going to make the recipes available, say so, and just admit you’re just another deceptive site trying to sell me stuff I don’t want. Excellent! I add 1 tsp vanilla as well. Tip: use a 1/4 cup measuring cup instead of the ice scream scoop to deliver exactly 12 macaroons! Didn’t see the oven temperature anywhere. 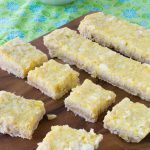 Is there a substitute for coconut butter? Sorry about that. It’s 325 degrees F. All updated now.